90% of people answer this puzzle wrong. In this math puzzle, you will have to find out the value of “N” from the series and then solve the given equation. These types of math puzzles asked in bank or other Gov. Exams. In exams you will get only 1 minute for one question or many be less, but here; take your time and comment your answer in comment box. Q. If 26, 52, 104, 208, N, 832, 1664. Then N – 16 x 0 = ? Answer: When you multiply the series number with 2, you will get the next number (Eg. 26×2=52, 52×2=104, 104×2=208 and so on), therefore we will get “N” which is 208 x 2 = 416. And then N–16 x 0 => N-0 = N => 416. (Apply “BODMAS” rule). Is your answer is right? Share this puzzle image with your friend on Facebook or WhatsApp. Let see, if they can solve this puzzle or not. 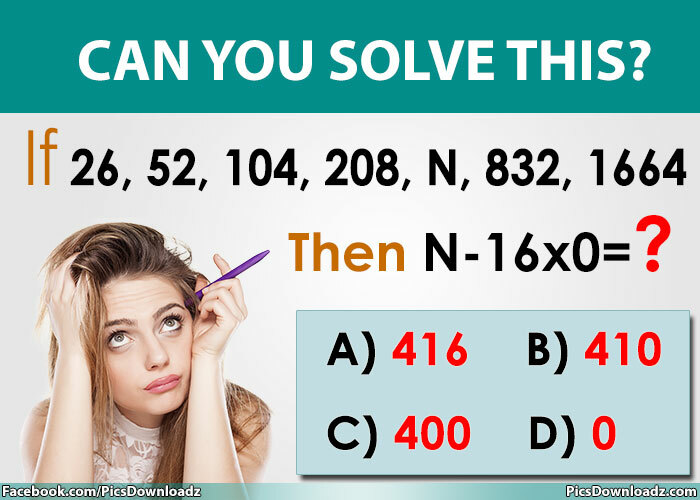 Find number in series, Math Puzzles, Find letter in Series, Math Game, Puzzles, Brain Teasers, Logic Puzzles, Riddles, Riddle Game, Interview Questions, Whatsapp Puzzles, Puzzle for Share, Puzzle for Facebook, WhatsApp Riddles, Brain Game Riddles, Brain Training Puzzles, Challenge your Brain, Confusing Riddles, Difficult Brain Teasers, Difficult Math Puzzles, Find missing number, Fun Brain Puzzles, Fun Riddles Brain Teasers, Hard Mind Puzzles, Math Riddle Answers, Math Fun Questions, Mind Puzzles Riddles, Number Series Riddles, Puzzles and Mind Games, Riddle Brain Teasers, Riddle Websites, Riddles and Mind Games, Riddles and Puzzles, Solve this if you are a genius, Genius Riddles, Interview Questions Riddles, Only for Genius, Only for Genius Puzzles, Math Puzzle with Answer, Genius at Work Puzzles, Interesting Puzzle Games, WhatsApp Puzzles, Facebook Puzzles, Genius Puzzles, Puzzles for Genius, Can you Solve This, Mind Puzzles, Find Value of N, Find Number Puzzles, Find Letter Puzzles.